While searching YouTube, I came across episodes from the Welsh children's television series "Funnybones." 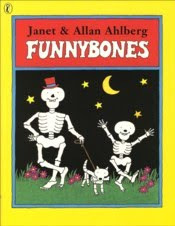 Watching this jolted me through my memory to my childhood, when one of my most beloved picture books, by Janet and Allan Ahlberg, were the "Funnybones" series. The show aired in 1992 for several episodes, and I'm sorry to say I never knew about them. These pictures, words and Big and Little Skeleton and their skeleton dog contributed much in my formative years to my love for what lies in the dark, dark, dark.